The German battery manufacturer Voltabox is continuing their expansion, and has purchased the US battery manufacturer Navitas Systems, a specialist for battery systems in the intralogistic area. The supervisory board still has to confirm the decision, however. The acquisition presents the first forage into battery cell technology for the Germans, even if only in the sector of specialty manufacturing. The company maintains their resource supply from a number of manufacturers from China, the USA, Korea and Japan, but has acquired some manufacturing competency with the acquisition, particularly in specialist areas. The second advantage in the takeover was named as the better access to North America’s intralogistic market, which the Delbrück-seated company is hoping to gain through Navitas. The 2010 founded company owns a 5,000 m² research, development and manufacturing facility in Michigan. There they manufactured different battery cell types from the German manufacturer Manz, which was established earlier this year. 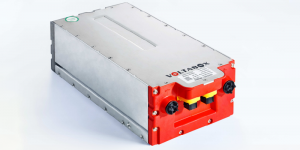 The production capacity for the battery cells is currently at 600,000 units per year, and will be expanded to 1.5 million in the near future, was announced by Voltabox. The researchers will also begin developing solid state batteries and lithium-sulphur battery cells soon. Only a few days ago, Voltabox announced the entry to direct sales of intralogistics applications. Furthermore, the company is expanding the cooperation with Triathlon batteries for intralogistics, which began in 2015. The battery system manufacturer also purchased the US engineering service provider Concurrent Design.